Perennials return year after year, bringing color to your garden on a regular basis. Their planting time ranges from spring until fall, but perennials can be enjoyed year-round. Every month, there are opportunities to nurture perennials. The following guide offers tips on how to care for perennials season to season. Early spring is the best time to plant summer perennials. Perennials are hardier than annuals, so they can be started as early as April. Once the ground has thawed and dried out to the extent that it’s workable, dormant bareroot perennials can be planted. Two to three weeks before the local average frost-free date, potted perennials can also be planted. Perennials started outside can begin to acclimate to the cool weather. Once frost is no longer an issue, any bareroot or potted perennial can be planted. At the same time, perennials that aren’t producing blossoms should be dug and divided. It’s possible to plant heat-tolerant perennials at this time. 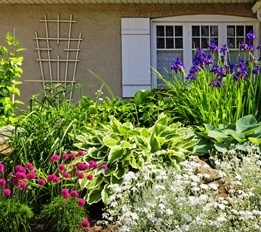 Refrain from dividing perennials, as this task is less successful in the summer. Plant early spring perennials in the fall, but stop once the ground freezes. Cold-tolerant perennials can be planted in the fall—the earlier, the better. That way, strong root systems have a chance to develop before the onset of harsh winter weather. If they aren’t blooming, perennials can also be dug and divided in autumn. Overcrowded bulbs produce diminishing returns; in the fall, they can be thinned out and replanted in areas that are more open. Sensitive bulbs like gladiolas need to be dug up before the first frost occurs then replanted in the spring. Perennials can’t survive extremely cold conditions. To protect their plants, gardeners overwinter their perennials when temperatures drop. Putting perennials in containers and bringing them inside helps these special plants survive the coldest months of the year. Winter can be a dark, sleepy time of year. Wake up the senses by taking in the natural beauty of perennial houseplants while the yard lies dormant. Once the days begin to lengthen, perennials can then be taken back outside, and the cycle of planting season begins again!